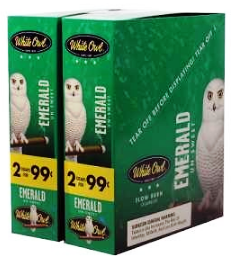 White Owl Emerald 2 for 99¢ Cigarillos cigars offer a smooth and satisfying smoke without the dessert-style sweetness found in this popular brands other lines. Featuring an all-tobacco wrapper on top of Caribbean Basin Cuban- seed filler, you will experience a naturally sweet tobacco taste and aroma. White Owl Emerald 2 for 99¢ Cigarillos is ideal for short breaks or when you don’t have time to kick back and relax with a full-size cigar. Available in 30 packs of 2 each.